HICKORY, N.C.--(BUSINESS WIRE)--CommScope’s Multi Tenant Data Center (MTDC) Alliance welcomes five new members to its impressive roster, while adding an advisory board to help enhance the multi tenant experience for operators and customers. The new board includes leaders from the industry’s most influential, global multi tenant providers, such as Digital Realty and Equinix. 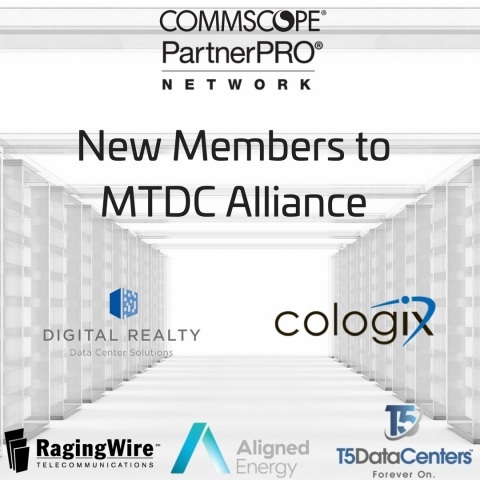 Formed in June 2017, the MTDC Alliance – part of CommScope’s PartnerPRO™ Network – was created to address the shift taking place in which companies increasingly outsource data centers to shared environments versus building, owning and operating their own. Leasing space in an MTDC allows business owners to enjoy optimal data center availability, reliability and cost control. Equinix was the first member of the PartnerPRO Network to join the MTDC Alliance. Digital Realty is a global leader empowering the data center, colocation and interconnection strategies of more than 2,300 firms across its secure, network-rich portfolio of 185+ data centers located throughout North America, Europe, Asia and Australia. RagingWire operates 1.5 million square feet of data center space in top data center markets in North America and is part of the global data center platform of NTT Communications with 140 data centers in 20 countries, making it one of the largest data center companies in the world. T5 has delivered or operated more than 100 mission critical facilities containing 11 million square feet of space for some of the world’s leading companies. Cologix has data centers in nine strategic North American edge markets that enable connectivity to the most robust network and cloud ecosystems within those regions. Aligned Energy is an infrastructure technology company that offers colocation and build-to-scale solutions to cloud, enterprise and managed service providers. The CommScope MTDC Advisory Board will help clients better understand product and solutions needs, as well as services that can be provided by all members. The board will meet bi-annually. “Our MTDC advisory board can help customers find the right location and space that suits their needs. There are a lot of questions, and we’re here to provide the right answers,” said Angela Haneklau, vice president of global ecosystem partners for CommScope. To help users further gain an understanding of the physical infrastructure, design requirements and strategic considerations that must precede a successful MTDC deployment, CommScope and several members of the advisory board have published its first eBook. It will touch on internal planning, new installs and actual migration to a multi tenant facility. The first two chapters of “Get the Most from Your Host: Best Practices for the Multi Tenant Data Center Migration” are available at www.commscope.com. CommScope's MTDC Alliance welcomes five new members to its impressive roster, while adding an advisory board and publishing two chapters of an eBook.